The job needs getting done and since you have the will and the ability, you have volunteered. With the deepest respect, I submit to you the proposal from what I believe to be the vast majority of the Israeli population and the religious world at large including here the Iranians and the people of Russia and the Ukraine. Time is very short and I like yourself and so many others, am ready to make big sacrifices for our Lord, the father of creation. He who loves the father also loves ALL the sons of this father. The 12th Imam is indeed amongst us, his Name is Rav Israel Ber Odesser. He was born out of a well in Tiberias. He Ran from Uman to Tiberias and the name of the Shiite Republic is I Ran or (I Rabbi Nachman). This is not crazy at all, there is even a precedent which everyone is familiar with. Josef who was considered inferior by both his brothers and the Egyptians (Arabs) was buried in the Nile and later he came out in the form of Moses and Joshua Ben Nun, his wife who he never married lived 400 years to bury her husband in the appropriate place. To make a comparison Rabbi Nachman's wife would still be considered young at 220 today, Rabbi Nachman like Josef never actually lived in the same place as she did and never gave her children or even slept with her, but she was willing to marry him, today we have no such ancient elderly lady of 220 yrs so the similarity stops here. Yet new elements that did not exist before with Josef come in droves and I will list enough of them here for a critical thinker to be able to draw his conclusion that the 12th Imam exists, he is a man of Gd and he does not spit on any religion, but wants a Gd fearing Peace, based on Life, Love and the pursuit of Truth. The first step is the most important, and if you start walking from Uman to Odessa in direction of Israel, it will take you 354 Km to accomplish this 7 day journey. The Gematria of Na Nach Nachma Nachman is 354! You can call that a jubilee to the 3ed power. Meuman (From Uman) to Odessa (Odesser) then you have the sea or Ber (well in Hebrew) then you have Israel (the nation or the baby) the first letters of which spell Ebay (fountainhead) of the ever flowing (Ha Nachal) source of wisdom (Ha Nachal novea mekor hochman: Rabbi Nachman). This is the name of the first book of the Israeli Presidency made by the first Minister of Education, President Zalman Shazar in cooperation with Nobel Laureate Dr Shai Agnon. I myself founded the village by that name and made the 354 km. walk. This demonstrates one first reason to believe Rabbi Nachman did come out of the well. 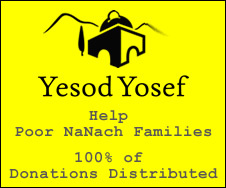 A second demonstration that Rabbi Nachman came out of the well is connected to Josef being the source of all wealth. Indeed before PM Bibi or the BIS decided to change the figures on the Israeli Shekel all four of them had participated in the creation of the book Ebay Ha Nachal with the letters written to President Shazar by Rabbi Odesser (which means 10- the coin). All the money being coincidentally related to this book until it was signaled to the PM. This seems to be proof enough, but we can go a lot deeper into this, if you remember, that Tamar and Leviatan were discovered off Rosh Ayn, yet the Israeli Government lost their ability to tax these resources (most Oil nations fund their government through the oil production) after they changed the figures on the bills. Even the announcement of changes always cause forest fires and the death of jail keepers, (44 in Haifa and 1 in Kiriat Sefer (city of the book)). A third demonstration that Rabbi Nachman came out of a well in Tiberias is connected to Rabbi Meir Baal Ha Ness whose Hilloula will be next week. This great Rabbi from Tiberias is buried right near where Rav Israel was born and where he found the letter. Rabbi Meir is buried standing up so he can be the first one to come out when the Messiah arrives. He is not buried according to Halacha and he is a convert. He is called Baal Ha Nass because of all the miracles and charities that take place thanks to him. A fourth demonstration that Rabbi Nachman came out of a well is that Rabbi Odesser said about himself: "You don't know who I am, I am Rabbi Nachman, I am the King" this corresponds to Rabbi Nachman's last words: "What are you worried about, I go before you, just be together and I will be with you". He did arrive, but to bring the bones, we need to be together united. If we are not united, we should worry, because if the bones are not brought her then...(BWEWS might not function, I suggest therefore investing 10% of this deal, remember I spoke to Livni). The thith demonstration, I should stop here, is that the mission of the Maddi is to make the world believe in Gd again. I think that's exactly the issue here. I even think the world has never actually believed in Gd before, but they will now, because "truth will grow from the soil of Israel" and THE Saint is compared to the soil upon which everyone treads, (Likutey Moharan) very likely the village of Ebay which now exists, or the well from which he emerged in Tiberias. I have focused here on proving that The Maddi is for real, and therefore we have a genuine means of communicating with the Iranians. There is a similar way to communicate with the Palestinians and the Sunnis, but my favorite is communication with the Alawi. The Palestinians (PA, Fatach intelligence) have already been informed by me that Pharaoh was before and after Josef a cannibal (until the Ninve episode where he made the 70 nations acquire an attribute of holiness by fasting for three days which corresponds to being charitable, humanity is now charitable). Bringing Rabbi Nachman's bones to Jerusalem through their initiative will change their magicians into priests like crowning Josef did for the Egyptian Pharaohs. Before and after the Pharaohs that knew Josef the priests are called magicians (and they mean cannibals). You now have a way to avoid open violence to eliminate the killers from the streets. Most predators are eventually extinguished and that is what is in store for the magicians, unless we can change their polarity. The Alawi have an impressive Monarch in Morocco and a loser optician in Syria. Almost all Arabs have great respect for the King of Morocco and would desire his form of administration throughout North Africa. Placing someone from that Monarchy in Syria would connect the Maghreb and make it one single bloc, not through persecution of Jews, but through the recognition of their right to the Mellah, "Israel". The Arabian Peninsula and the Shiite areas could also become economic and cultural blocs that trade on an equal basis, because slavery has become absolutely unacceptable, and an aberration to real Muslims, there is no War, no slavery, the Jihad is over. Descendents of Mohamed rule over the Arabs and they have recognized the Maddi to be Rabbi Nachman. I believe the 70th anniversary of Israel to be the final deadline, but success would be to have him here by Rosh Hashana. I think a tax from those that have invested in Israel is reasonable, because it would only contribute to increasing their profits anyways. This is something that can only be done by government. The most classy way to do all this would be to honor Prince Philip with being the official patron for burying Rabbi Nachman on Mt Zion with King David the King of King. Prince Philip will want to do this before October, a successful conclusion to his career as Monarch to the Crown of England. This would boost the economy of Britain immensely as it will all Monarchies in general. As the President of the people and not of the bureaucracy, I know you will immediately understand the wisdom of these words. I send you all my gratitude and blessings from Zion Square in Jerusalem, where my precious friend Mr Sam Ben Chetrit (President of The World Federation of Moroccan Jewry) and I are ready to spring into full action at your service.